Converted to Christianity late in life. Married Constantius Chlorus, co-regent of the western Roman empire. Mother of Constantine the Great. Her husband put her aside for a second marriage with better political connections. On his death, her son ascended to the throne, brought her home, and treated her as royalty. She used her high position and wealth in the service of her religious enthusiasm, and helped build churches throughout the empire. At the age of 80 she led a group to the Holy Land to search for the True Cross. She and her group unearthed three crosses in 326. At the suggestion of Saint Macarius of Jerusalem, she took them to a woman afflicated with an incurable disease, and had her touch each one. One of them immediately cured her, and it was pronounced the True Cross. She built a church on the spot where the cross was found, and sent pieces to Rome and Constantinople; the Feast of the Holy Cross on 14 September celebrates the event. Thus in art, she is usually depicted holding a wooden cross. Alberto's father died when the boy was four years old, and he grew up in poverty. Educated at the Jesuit College in Santiago, Chile. He early felt a call to religion, and to work with those as poor as himself. He entered the Jesuit novitiate in 1923, and was ordained in 1933. He taught religion at Colegion San Ignacio, trained teachers at Catholic University in Santiago, led retreats for young men, and worked in the poor areas of the city whenever he could. In 1941 he wrote Is Chile a Catholic Country?, and became national chaplain to the youth movement Catholic Action. 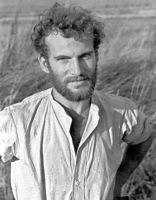 During a retreat in 1944, Father Alberto started the work that would lead to El Hogar de Cristo which shelters the homeless and tries to rescue abandoned children, and was later modelled somewhat on the American Boys Town movement. In 1947, Hurtado founded the Chilean Trade Union Association (ASICH) to promote a Christian labour-union movement. He founded the journal Mensaje, dedicated to explaining the Church's teaching, in 1951. He wrote several works in his later years on trade unions, social humanism and the Christian social order. Son of Martín Martínez Callao, a carpenter, and Francisca Pascual Amposta; Martin was baptized at the age of one day. He was a religious child. He joined the Diocesan Laborer Priests of the Sacred Heart of Jesus in 1934 while in seminary in the diocese of Zaragoza, Spain. Priest, ordained on 15 June 1935 in the diocese of Tortosa, Spain. Taught at a vocational Colegio San José de Murcia, and then taught Latin in the seminary in Murcia, Spain where he was considered an excellent instructor. At the outbreak of the persecutions of the Spanish Civil War, Father Martin grabbed the reserved consecrated hosts from his church and went into hiding, spending his time in prayer while sitting in caves and haystacks. He evaded the militia for a few days but was caught and imprisoned where he spent his remaining time ministering to other prisoners, hearing confessions, and distributing the Eucharist he had rescued; he died giving his executioners a blessing in hopes that they would come to their senses. Martyr. Born to an imperial patrician family. At fifteen years of age, the boy proudly, publicly proclaimed his Christianity during the persecution of Aurelian. Martyr. Because he was a young man, and because the heroic way he met his martyrdom brought about many conversions, his was a favourite story in times past, and often grew in the telling, but we know very little about him for sure. Monk at the monastery at Pelekete, taking the name Macarius. Abbot. Miracle worker. Ordained by Patriarch Tarasius of Constantinople. Imprisoned and tortured for his opposition to Emperor Leo's orders of iconoclasm. Released by Emperor Michael the Stammerer, then exiled for his continued support of icons. I hasten on rising from sleep. and I make my prayer to you. Help me at all times and in all things. and from pursuit by the devil. You inspire all good thoughts in me. Benedictine monk. Abbot of La Trinita de La Cava Abbey in 1232; he served for over 22 years. Known as a wise, gentle, peaceful man, an able administrator, and a leader smart enough to keep his house out of political fights of the day. Attended the Council of Lyon in 1245. He led by example, and his brother monks became known for their devotion to the Benedictine Rule. Accepted and cared for the relics of Saint Bartholomew the Apostle and the treasury of the diocese of Benevento, Italy when that area was overrun by invading Germans. When peace returned, he returned all the treasures entrusted to him; the diocese enshrined some of the relics of Saint Bartholomew to the permanent care of the abbey. Greek rite monk from Calabria, Italy. Monk in the Abruzzo region of Italy, possibly fleeing Muslim raids on monasteries in Calabria. Hermit in the central Appennine mountains. Priest in the diocese of Limoges, France. Imprisoned on a ship in the harbor of Rochefort, France and left to die during the anti-Catholic persecutions of the French Revolution. One of the Martyrs of the Hulks of Rochefort. Priest. Canon of Lodi, Italy. Bishop of Vicenza, Italy in 1296. Held several governmental posts in the papal states. Archbishop of Ravenna, Italy in 1303. Defended the good work of the Knights Templar. Spiritual student of Saint Finnian of Clonard. Bishop of Inish Cain Dega (Iniskeen or Iniskin), Ireland. He founded a monastery there, and served as its abbot. The Book of Leinster describes him as a one of the Three Master Craftsmen of Ireland, though its unclear exactly what this means. Pilgrim to Rome and Jerusalem. Hermit at Ayrshire, Scotland where several wells are named for him, and churches dedicated to him including one, now dedicated to Mary, which is thought to have been built on the site of his cell. Nephew and spiritual student of Saint Columba of Iona. Missionary to the Picts. Founded a monastery in Donegal, Ireland. When Saint Columba died, Ernan had a vision of Columba's soul ascending to heaven. Saint Adamnan of Iona mentioned Ernan in his writings. Twin brother of Saint Laurus of Illyria. Stone-cutter who worked to build Christian churches. Martyr. Mercedarian friar and travelling preacher. In 1419 he helped ransom 293 Christians from slavery in Muslim Granada. Twin brother of Saint Florus of Illyria. Stone-cutter who worked to build Christian churches. Martyr. 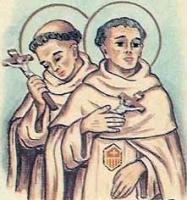 Born to the Frankish nobility, Milo and his father both gave it up to become Benedictine monks at Fontenelle Abbey. Milo later left the monastery to live as a hermit. Benedictine monk at Saint Andrew's monastery on the Coelian Hill, Rome, Italy under abbot Saint Gregory the Great who later wrote about him. Miracle worker. 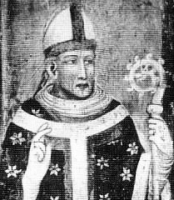 Archbishop of Arles, France in the late 5th and early 6th century. Fought the Pelagian heresy. 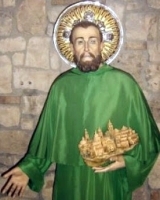 Ordained Saint Cesareo of Arles. Monk at Iona Abbey. Was involved in the controversy with Saint Finan of Iona concerning the celebration of Easter. Confessor of the faith. Priest in Rome, Italy in the early days of the Church. With Saint John of Rome he recovered and properly buried the bodies of martyrs - and was martyred for it. Sculptor. Stone-cutter who worked to build Christian churches. Martyr. Martyred by a pagan mob. Bishop of Metz, France for eight years. Three hundred 3rd century Christians at Carthage who were ordered to burn incense to Jupiter or face death by fire. Martyrs. Saint Augustine of Hippo and the poet Prudentius wrote about them.